Oppenheimer was commissioned from Tom Morton-Smith by the RSC as part of their ongoing mission to tackle big ideas on stage in a way that compliments and challenges the Shakespeare productions that the RSC is naturally best known for. 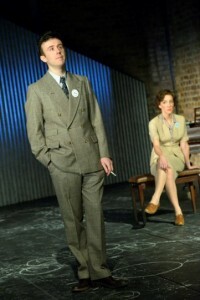 In his programme notes for Oppenheimer, Morton-Smith says that he pitched the idea for the play after attending a workshop at the RSC in which writers were invited to consider the “scale of the ancient Greek chorus and what sort of language and literary register is required to fill a space such as the Swan Theatre.” A tall order indeed. 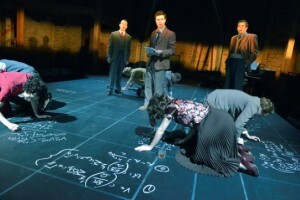 The play tells the tale of the people who worked on the Manhattan Project during the Second World War and the race to develop the world’s first atomic weapon. J Robert Oppenheimer as project leader is naturally the focus of the piece. His oft-troubled relationships with fellow scientists, friends, family and lovers are presented on a background of strained ideological, military and personal politics. With a cast of over twenty, the list of characters reads like a who’s-who of 20th century physics. Add to this an ensemble of live musicians, cabaret singing, and choreographed parties and there is no doubt that director Angus Jackson achieves the sense of scale that was sought from the outset. The figure of Oppenheimer might initially bring to mind classical tragedy. But as Morton-Smith points out, this aspect has been tackled previously. Moreover, many of the conventionally tragic aspects of his character (“Shakespearen in its rise and fall” according to Morton-Smith) occurred much later in his life, a period not covered in this play. If the spirit of Shakespeare infuses this work at all then it must be in the sense that Oppenheimer might be more appropriately considered as a history play rather than a tragedy. The depth of information and level of research represented in the work is apparent throughout and must surely represent as historically and sociologically a complete account of the period as it is practical to achieve in an evening’s theatre. And where there are biographical facts there is also science. This is not a play that shies away from presenting the science of the bomb up-front. Where other plays have perhaps turned largely to metaphor to relate scientific ideas, much of the science of fission and weapon design is conveyed directly in a series of short lectures. These lectures acknowledge the artifice of theatre and allow each character to speak directly to the audience. In contrast, the sequences in which characters are discussing ideas with each other in the dialogue struggle to convince that this is really the language knowledgeable colleagues use to talk to each other. This is always the dilemma of representing professional activity on stage or screen, from a television police show to a piece of science-theatre like Oppenheimer; there is always a certain amount of mutual knowledge in professional communication that is simply not possible to assume in performance. Nonetheless, the delivery is emphatic, perhaps in a conscious (but unnecessary?) effort to make the content more interesting by expressing it with confidence. Does the play fall victim to it’s own scale of ambition? It is interesting that Morton-Smith chooses to continue the plot for some time beyond the initial bomb test at the Trinity site. It is no spoiler to point out that the Manhattan scientists achieved their goal and created a weapon – that fact is recorded forever in history. The events at the end of the war and beyond are part of the common historical record: the destruction of Hiroshima and Nagasaki and the political tensions that led directly to the Cold War. Could the play have ended with blackout following the Trinity explosion? Naturally it can be argued that the most significant and complex moral questions and reactions are to be explored after the bomb is deployed in warfare. But at three hours long the endurance required of the audience must be earned not assumed. In a climate where science and scientists are increasingly welcomed into cultural conversation, it is both commendable and a risk for the RSC to back a large scale, full length production that doesn’t shy away from the difficult questions and details of the science. But with the risk comes a responsibility to make sure the topic is conveyed in an accessible manner, but which is ultimately good theatre. It will never be possible to achieve this balance perfectly. 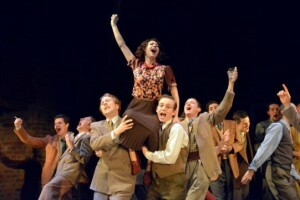 The scale of Oppenheimer is unique for this genre, and something only possible for producing companies such as the RSC to enable. The great achievement is that it has been commissioned and produced at all. The commercial and critical success of the Stratford production has clearly been sufficient to merit a West End transfer and the opportunity for larger audiences to engage with it can be no bad thing. 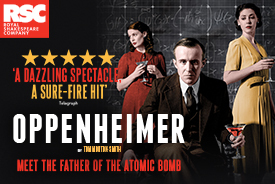 Oppenheimer is at London’s Vaudeville Theatre until 23rd May 2015.